The Chamberlain Scholarship Program honors Ralph Chamberlain, CFRE, a long-time fundraiser and supporter of AFP. Mr. Chamberlain helped to form one of the organization’s first chapters, the Greater New York Chapter and served as both chair of the association and the foundation. 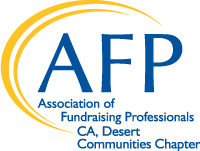 Because of his long-time support of the Foundation for Philanthropy, the AFP Board of Directors renamed the Conference Scholar Program in 2000 to honor Mr. Chamberlain’s memory and commitment to the fundraising profession. Each year in August, the CA, Desert Communities Chapter opens nominations for the Chamberlain Scholarship to its membership. Watch this page for future Chamberlain Scholarship applications.